What is Slot Car Corner Canada? Slot Car Corner Canada is an online retailer of high-performance 1/32 scale slot racing products. I sell cars, tires, wheels, tuning parts, motors, controllers, tools, decals, track braiding products, etc. Most of my products are aimed at the enthusiast slot racer who has begun to tune and adjust his cars to get better performance (and more fun!) out of them. If you're a beginner, there are also a lot of products for you, of course. And don't forget that being a beginner is always a temporary status! Slot Car Corner Canada was created in January 2009 so i've been here for a while! It was born as the Canadian branch of Slot Car Corner, which my very good friends Steve, Dickie and Bob are operating south of the border. After meeting each other on slot racing forums on the web, we started racing together in 2006 and as we became better friends over the years, we decided that Canadian slot racers would be better served by a Canadian store and that’s how it got started. Where is Slot Car Corner Canada? 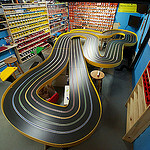 Slot Car Corner Canada is located in beautiful Québec, QC. I am bilingual but French is my native language so I'm happy to serve all my French-Canadian customers in their own language, whether they live in the province of Québec or anywhere else in this great country of ours. Even though most of the communications are in English, don’t hesitate to contact me in French. Malgré le fait que la majorité des communications soient en anglais, n’hésitez pas à me contacter en français. Ce sera un immense plaisir de vous répondre dans votre langue, puisque c’est aussi la mienne. Who is behind Slot Car Corner Canada? I’m Christian Gingras and I’m the proud owner of Slot Car Corner Canada, in addition to being the customer service specialist, the inventory guy, the shipping department, the testing group, the mechanical engineer, the accounting team and the janitor. When we say ‘we’, we mean all of those guys, who are all the same individual. I’m a 51-year-old man, with a wonderful wife and two beautiful daughters (16 and 20) to share my life with. My real (paying) job is at the head office of Université du Québec, where I’m Director of material resources and facilities, managing buildings and student dorms, along with mail and computer services, with the help of very efficient people around me. Racing, technology and good friends help to keep me sane when I get out of the office each day. Is Slot Car Corner Canada a full-time job? No. If it was, I would have to live on a salary of less than $3/hour (not joking!) so I wouldn’t be able to even afford the bins in which our products are waiting for your orders. It’s a part-time thing, with which I’m still making less than $3/hour (still not joking!). Slot Car Corner Canada is an additional way for me to enjoy this wonderful hobby and to help my fellow Canadian slot racers. I get to know great people (that’s you! ), be involved in the development of nice and useful products and be part of a very nice group of friends who share the same passion. If money was a motivation to keep Slot Car Corner Canada around, I would have abandoned a loooooong time ago. Sharing my passion for 1/32 slot car racing is my one and only motivation. When have you started to race slot cars? 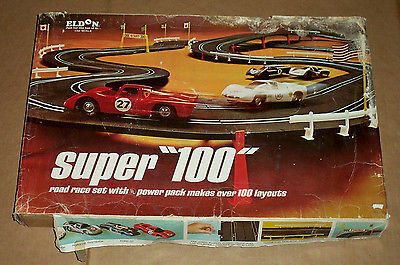 I remember very well racing slot cars as a very young boy with my father and my brother before I started going to school, on a permanent Eldon track in our home basement. When we moved to another city, the track did not survive. Then, in 2000, mostly as a joke, my father gave me a Scalextric race set as a Christmas present. I never looked back since, having spent many tens of thousands of dollars in this addicting hobby. I’ve raced on plastic track, temporary and permanent, then went on to club racing on a 4-lane track, then built my first of many wood tracks, removed magnets, learned to tune cars, etc. In the last 10 to 12 years, our racing became more serious (but still always fun!) with club racing including point standings, multiple endurance races ranging from 3 to 24 hours, and long road trips to compete with other passionate racers all over the continent. I’ve learned so much over those years, from driving all kinds of cars in various conditions but mostly by sharing tips and parts with other racers. And the nice part is that there’s still so much to learn and share, always. What is the Slot Car Corner Racing Team? In 2010, there was a 24-hour race held in Chicago and we decided to be a part of it, to spend a fun weekend with friends. We had been racing with the Northeast US guys for a few years and we created a team with the SCC/SCCC owners and some close collaborators. We made sure that the classic SCC yellow and black colors were shown and that’s where we started getting more into it. We finished in 2nd place at that race, behind the guys from Atlanta. But most of all, we understood that those endurance races were the perfect events to test our own products and to make sure they would be useful and reliable for our customers. Since then, Team SCC has been participating in the Michigan 24 each year, winning 6 of the 8 editions so far and establishing three world records doing so (for distance in 24 hours, with a plastic-chassis 1/32 car). Our yellow and black «bling» is always something to see, we’re having a lot of fun and we’re testing products at the same time. The most recent Michigan 24 took place in April 2018 and we have every intention to keep having fun (and winning) at this event. Team members are Steve Sawtelle, Mike Chiocchio, Dickie Pearson, Georges Hamel and myself, Christian Gingras. In 2010, Claude Boucher was also a part of the team and in 2015, Kurt Moser joined us in replacement of Dickie Pearson. Why don’t you have a real store that I could visit? Having a brick'n'mortar store would require an investment in time and money that I can’t justify with my current job and family. It would not be a hobby anymore and I want to keep this fun. If you are visiting the Québec City area and want to pay me a visit to pick up an order, just send me an email and we’ll try to arrange something. Why don’t you sell some popular brands like Carrera, Scalextric, NSR, etc.? Most brands work by having a distributor support their product line in North America. And a good proportion of those distributors require dealers to have a brick’n’mortar store to carry the product lines they distribute. That’s currently the case for the above brands. As Slot Car Corner Canada’s reputation grows, I'm sometimes able to convince some distributors to let me carry their products anyway but this is a slow process. I also want to sell what I use and use what I sell. In order to be able to give you my renowned customer service, I need to know our products well. Having a warehouse full of products I've never tried or used on a regular basis is not my idea of good customer service. Less products and higher quality means better service when something goes wrong. That’s how I like to do business! Why don’t you have the same products on your website than the SCC (US) website has? The distribution networks are sometimes different in the US and Canada and the conditions (and costs) are not always the same. Also, my friends at Slot Car Corner have a much bigger market to serve and they have to adapt differently to their local customers and their needs. Finally, since they have a small brick’n’mortar store, they’re carrying more brands than what I can carry for now. Why don’t you have Digital products? Most Digital products in use in North America are from Carrera, a brand which I don’t carry right now. Also, because I almost exclusively run on wood tracks, I know less about Digital products and I wouldn’t be able to help my customers the way I wanted to if problems would occur. I carry some Digital products from Slot.it, which work with the Scalextric Digital (SSD) products and also with their own oXigen system. Why do you have to charge taxes on all orders? Before I went over $30,000/year in sales, I had the choice to charge taxes or not. And I didn’t charge them. Now that the business has grown with sales well over $30,000/year, I have no choice but to charge the sales tax (variable rate, depending on your province). How do you deal with the always-changing exchange rate? Since most of the products I sell are coming from the US and the pricing is in Canadian dollars, the exchange rate is always a concern. Of course, I can’t keep on modifying our pricing on a regular basis (it’s an administrative nightmare to change the pricing of several hundreds of products!). But when the exchange rate moves too fast, like it has done in the last few months, I have to adjust the pricing accordingly. And keep in mind that when the official exchange rate is 25% (for example), the banks and other financial institutions add their own fees of 2 to 3% on top of that so the real cost is higher than the exchange rate (you’re paying the same fees on your credit card when you make a purchase in the US). 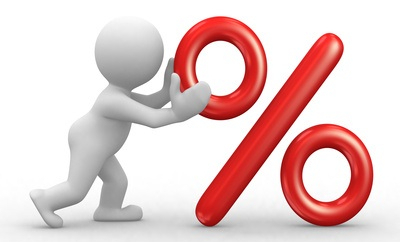 99% of the time, the pricing will be to the advantage of Canadian customers over the same product at the same price in the US. What can we expect from Slot Car Corner Canada in the future? More quality products, same great customer service, hopefully new brands in stock. Products that are tested in real life, by real drivers on real tracks in real races. But above all, a slot car friend always ready to share and learn.